On Tuesday, March 13, 2012, State Senator John Bulloch, State Representative Gerald Greene and Early County 2055 hosted a legislative reception in Atlanta, Georgia. The purpose of the reception was to celebrate the progress of Early County 2055 and the completion of the Advancing Early Initiative 2012 (AEI2012), the five-year strategy carved from our Early County 2055 50-year master plan. What started with a generous gift from the Charles and Catherine B. Rice Foundation has become an exciting economic revitalization project that is helping to preserve the area’s valuable history and culture, while building the framework for a diversified economic structure and master strategy for the future. Speaker of the GA House of Representatives, David Ralston; GA Secretary of State, Brian Kemp; Mark Butler, Commissioner, GA Department of Labor; GA Attorney General, Sam Olens; Larry O’Neal, House Majority Leader; Keith Golden, Commissioner, GA Department of Transportation; State Senator John Bulloch; State Senator George Hooks;State Senator John Wilkinson; State Representative Gerald Greene; State Representative Buzz Brockway; State Representative Mike Cheokas; State Representative Jay Powell; State Representative Ann Purcell; State Representative Delvis Dutton; State Representative Bob Hanner; State Representative Kevin Cooke; State Representative Lynne Riley; State Representative Michael Harden; State Representative Stephen Allison; State Representative Darlene Taylor; State Representative Sam Teasley; Johnny Floyd, Board Member, GA Department of Transportation; Adam Pipkin, Chief of Staff, Senate Majority Leader Chip Rogers; Tim Fleming, Chief of Staff, Secretary Brian Kemp; Dr. Richard A. Carvajal, President Bainbridge College; Jay Garner, Garner Economics, Inc.; Reed Benson, NCDS; and, Amanda Patterson, Georgia Trend. Ms. Collins said phenomenal progress has been made to clean-up the community. The AEI2012 five year goal to identify and demolish 35 dilapidated dwellings in Blakely was exceeded by partnering with the City of Blakely to remove 236 neglected structures. In addition, the goal of creating 24 new single-family homes was surpassed by partnering with Hammond Development of Atlanta to create 64 new single-family rentalhomes. Collins noted that by utilizing GA DOT Transportation Enhancement funds, construction of an attractive gateway entrance on the US Highway 27 bypass has begun, and will draw travelers off the bypass into the historic downtown Court Square of Blakely, creating additional revenue for the city of Blakely. It will also provide a visitor’s center and enhance the community’s wetlands. In addition, she added $1 million has been raised to renovate the historic Chamber building into a conference space and a businesslike Chamber facility, with construction expected to begin by June 2012. Collins announced the next phase, an 8-year economic development strategy, will be called 2020 Vision. Priorities will likely focus on attracting new businesses to support the growth of AIM, including hotel, retail and manufacturing; transforming the Magnolia Street corridor from the East Gateway to Blakely Court Square to increase shopping opportunities for tourists and residents alike along the main entrance into town; development of a Façade Improvement Program for Blakely Court Square and surrounding corridors; continued creation of viable housing options; continued community cleanup of dilapidated structures; and enhancement of community recreational opportunities for youth. In conclusion, Ms. Collins asked legislators and state officials not to forget our part of the state, and asked for their commitment partnering with Early County to continue the county’s extraordinary efforts of creating jobs, growing the tax base and improving the quality of life for all citizens in Early County. Attendees representing Blakely at the reception were: Claude Bell, Celia Bostwick, Dr. Chase and Elizabeth Brooks, Drs. Paschal and Kay Brooks,Matt and LeeAnn Dalrymple, Lee Conner, Christie Haynes, Brad Hughes, Hank Jester, Charles Middleton, Jimmie Murkerson, Mike Newberry, Joan Simpson, Renee’ Spence, Olin Thompson, Butch and Susan Wiggins, Aaron Edwards, Barton and Andrea Rice, Lisa Collins and Georgina Freeman. Following the legislative reception, on Wednesday, March 14, 2012, Early County 2055 hosted a breakfast at the Centergy Building in Atlanta, Georgia. The purpose of the breakfast was to once again celebrate the progress of Early County 2055 and the completion of the AEI2012 strategy. Even though the message was basically the same, the invited guests were different. 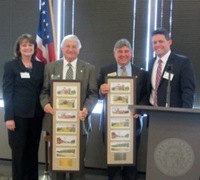 Attendees represented the important entities that drive economic development in the state of Georgia. Approximately 30 attended the breakfast. Representing the Georgia Department of Economic Development was: Deputy Commissioner of Global Commerce Gretchen Corbin, Stacy Davis, David Dunagan, Wylly Harrison, Kimberly Knight, Scott McMurray, Charlie Moseley, Dawn Price, Lauren Salas, Lynn Whitley, and Stella Xu. Representing Electric Cities of Georgia were: Darryl Ingram, Vice President; Charlie Gatlin, Director of Economic and Community Development; Michelle Cooper; Annie Baxter; Walt Farrell; Jason Fritz; Sharyn Finney; and, Amanda Fields. Representing Georgia Tech Enterprise Innovation Institute was Dana King Brewer. In addition, Barton Rice gave an update on the American International Marksmanship Academy and Lee Conner informed the group of the many exciting opportunities that SGRITA (SyncSouth) is providing to Early County and the entire region. Representing Blakely at the breakfast were: Hank Jester, Butch Wiggins, Charles Middleton, Olin Thompson, Mike Newberry, Celia Bostwick, Christie Haynes, Lee Conner, Barton Rice, Lisa Collins and Georgina Freeman.